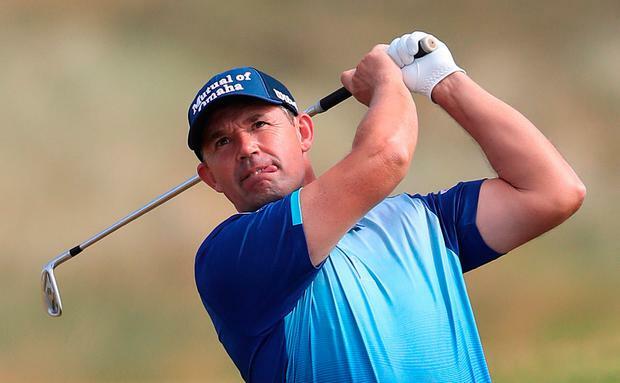 Two days after telling anyone who would listen that he was "good value" to win a second Dubai Duty Free Irish Open, Padraig Harrington proved his point with an opening 68 in the €6million event. Harrington, who is currently ranked 268th in the world and without a victory since 2016, carded an eagle, three birdies and a solitary bogey at Ballyliffin to finish four under par, a shot behind early clubhouse leader Ryan Fox. The three-time major winner has missed the cut in seven of his 12 events in 2018 but was surprised at the start of the week to find himself rated a 66/1 chance - or higher - to demonstrate his prowess on links courses and lift the trophy in Donegal. "There's not often there's value in my game," said Harrington, who won the Irish Open in 2007, two months before claiming his first major title in the Open Championship at this year's venue of Carnoustie. "The bookies in Ireland would make sure they cut you to a low price knowing that sentimentally people would back you. The bookies don't normally get it wrong, but to put me out there at 66/1 on a links golf course in my home country was strange on their part. "My performances always go up a level or two when it comes to a links course. Maybe they factored that in and that says I'm even worse than I thought!" Defending champion Jon Rahm had been a 7/1 joint favourite with tournament host Rory McIlroy, but the world number five struggled to an opening 74 which contained back-to-back double bogeys around the turn. Rahm, who started from the 10th, had been one under par following a birdie on the 17th, but duffed his third shot into a greenside bunker on the next and slammed his club into the turf in frustration. The 23-year-old, who insists he does not have "anger issues" despite previously attracting criticism for similar displays of petulance, then drove into a fairway bunker on the first and compounded the error by three-putting from long range, before repairing some of the damage with a birdie on the fourth. Playing partner Graeme McDowell was also in danger of getting off to a poor start in his bid for a first win since 2015, but birdied three of his last six holes to finish one under. "It was a grinding performance but nice to turn a 75 into a 71," McDowell said.